I want to change it up a bit... do you mind? I had another blog a while back- something my husband and I both were going to be a part of- a sort of "husband and wife" thing. In it, we were going to post things that inspired us, we loved, aspects of marriage that we found fascinating, hard times, etc. We did it for a little while, but then our other blogs (this one included) just demanded too much of our time- and our joined blog fell short. I was rereading one of the blog posts I had posted on it and it just totally breathed fresh air into my heart. It was exactly what I needed to read. When I wrote it- I had no clue I'd be ministering to anyone let alone myself! How funny, right? Any who, then I thought..."maybe someone else needs to hear these exact words of encouragement today?" I have to be completely honest....I'm seriously SO nervous about posting this. Nervous because...well it's a really "down to the bare bones"- exposed blog. It's not a "So today I baked and ate this awesome dessert and went shopping OH! and look what I bought!" blog. ...Also, it's saturated in the Lord. Which is fine with me (in fact I've been thinking about posting more and more blogs saturated in Him) but maybe some of my readers aren't so thrilled about that? I actually am really nervous to see how many Twitter followers I lose. Facebook too...oh and blog readers on here. Sigh...I guess a risk I AM willing to take though, right? I don't know- just sharing some of my thoughts and recent insecurities. We'll see how it goes. To me, there are two reasons we're reminded of past things we've done. One is Satan. He loves, loves, loves to see us in pain. I can't think of anything more that would bring him joy than to see us Christians going about our day, trying to please our wonderful Father in everything we say or do and WHAM! to be stopped dead in our tracks, stopped from pleasing God...almost like we hit a brick wall...to sit and dwell in shame, guilt, pain, and embarrassment. The above description of how my guilt usually hits me, I know now, is from Satan. Anything to get us away from pleasing Him...I truly feel he'll try and do anything. What pleasure it brings him too when our mood changes...our demeanor...our thoughts and even what we say. For me, it can be like night and day. I can be folding laundry, listening to worship music, singing along (happy as can be worshiping and praising my Father)...and then a little seed of a thought will slip into my head and everything I was currently doing shrivels up and dies within seconds. There are times when it's so crippling I can't do anything but cry and feel so "disgusting" or "unlovable". Now, yes...this is hard. No one likes to have any sort of correction happen. But we need it. I know I need it. And that's the truth! I know myself pretty well, and if my wonderful Father didn't keep certain thorns in my side, I would think I was pretty awesome (and in a bad way). I would not give God His much deserved credit for making me who I am today- why would I? I would think I was so awesome that I did it myself. I would believe that because of my "being such a good person" that THAT was the only reason I've overcome certain obstacles. This is how I used to think before being a Christian. Sad huh? The even sadder truth is, it's because of ME and my "awesomeness" that I got myself into those painful circumstances in the first place...Sheesh. Whenever I read this passage from Paul, I sit back and say "Oh yeah...that's right" and my frustration slowly dissolves into a "Ok Father...I remember why this is here...Thank you so much for helping me through that time." Let's be honest, it's only because of Him that I am who I am today and only with His help I got through ANYTHING. Now the hard part is this...deciphering between whether it's for your pain and destruction that you're remembering something in the past (Satan's doing)...or is it to remind you of how much you're loved by God and just how very special you are to Him..? Are you being beat down, crippled and crumbling in your thoughts? If so, then STOP right away and ask Him to protect you and help you get out of that downward spiral. I can assure you that's not from Him, but rather Satan- trying to keep you far away from glorifying and appreciating God. Just like an earthly father, God uses sometimes painful correction to help demonstrate what we were doing wrong and how to not go back to that sin again. Have you ever been spanked or grounded? I know I have and I hated every single time. But, looking back- my parents weren't doing it because they hated me (like I KNEW was the reason when I was 12)..rather they were doing it to correct me and help me not commit the same sin again. God can work that same way. He's making sure we don't go back. My husband and I recently took a little weekend trip to one of my favorite places- Big Bear. Living in L.A. we don't get to see much (well any) snow. We can glance at it at the far off mountain tops above the buildings, in the distance...but it never snows here...ever. What a treat it was to get out of the city and spend some much needed time together. While playing around and messing with our camera I looked at this part of untouched snow and completely got lost in how white and pure it was. No dirt, no footsteps. Untouched by man. One little branch stuck up but all around was the most white and clean snow. It hit me. God sees us this way. God sees me this way! How beautiful this snow was. How beautiful we are to Him! Since this blog topic is something I really struggle with, this whole thing hit me pretty hard. What a beautiful illustration He wanted to show me..miles away from home and any distractions. So, my last point, and the point I really need to learn, listen to, and remember- for this is the hardest part for me to really believe- is..when God reminds us of a past sin, it's to show us how He now sees us..White as Snow. The complete opposite of Satan and in many cases, other people. For God loves us SO much that as soon as we stop our sin and come to Him humbly and honestly..as soon as we apologize and repent for whatever it is we were doing (and I do mean whatever), our sin is erased and He sees us clean and forgiven. Crazy huh? "No matter HOW DEEP THE STAIN OF YOUR SINS"..."I can remove it and make you clean"...No matter how deep! This just blows my mind. I left for Big Bear feeling stained and soaked blood red. This color all around me that I swore everyone could see. But when I saw this snow, and remembered that verse (I should say "God spoke to me that verse") how uplifting, encouraging, and cleansing it truly was. I've repented for the sins I've committed...It's only my flesh, the world (other people), and Satan that want me to feel this burden and guilt. My Father, on the other hand...couldn't see me more differently. How sad it must make Him when we get caught up in believing what other's say or feel, or listen to the whispers Satan tell us. When all He wants is for us to rid ourselves of these painful feelings of being inadequate and in my case "disgusting" and see ourselves for how He sees us- White as Snow. Clean throughout. Forgiven and loved more than we could ever imagine. Not chained down to past sin, not controlled by it or defined by it. Rather freed of those chains, defined by His love, and fresh as newly fallen snow. It's so amazing. So friends...anyone reading this...if there's a sin you're feeling the guilt, shame, burden of- if you have not given it to Him...repented for that sin, turned away and trusted in Him...now's the time. He promises to be there and hold our hands through the punishment we may receive for what we did. He never said we wouldn't have to go through those types of pain, but He does promise us to be there right with us! How else will we learn from our mistakes if we don't have to reap the consequences of them? He wants us, like any loving father, to be lovingly corrected so we never do it again...so we're not like a dog returning to its vomit. So, why continue to punish yourself? Why give Satan that joy? It hurts. Satan hurts...he wants us to dwell and lose hope and joy. He wants us to get so caught up in shame that we think we'll never rid of it, nothing can rid of it- and that God has no power. I know this. I've been through it. Why make yourself suffer one more day, thought, or sleepless night...give it to Him. 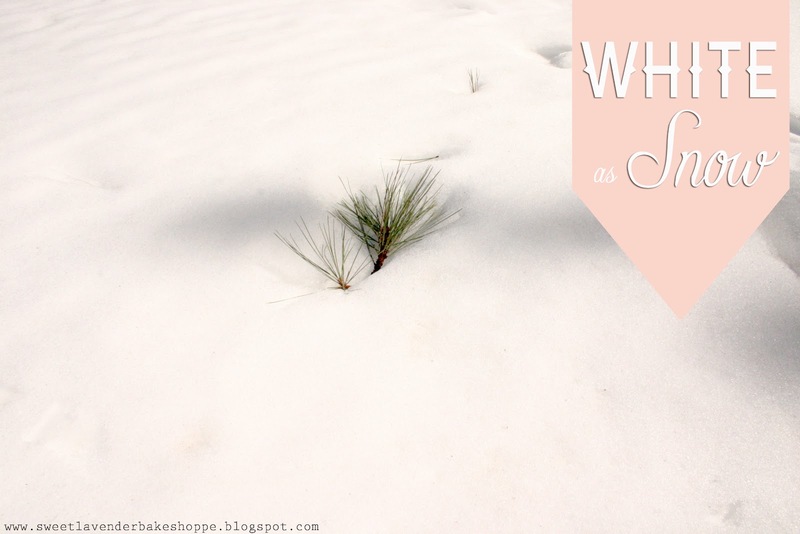 Ask for His forgiveness and ask Him to make you White as Snow. He will. This I promise. Beautiful post Christina, BEAUTIFUL! I needed a few words of encouragement today. Waking up without power from a bad storm, unable to really shake myself awake - I needed this. Once again your honesty gets me. I can not tell you how much this post hit home. And any of my close friends would tell you that I STRUGGLE with the ghosts of my life. I feel like I could have written that description at the beginning myself....just doing the dishes and BAM! This was a blessing today!! Thank you Christina! This is wonderful! I love it! Everything you wrote I was nodding in agreement as I feel/have felt the same way before! :) Thanks for such an encouraging post! Christina... you have such a beautiful way with words. You could write devotionals! You know, just the other day I was sitting here and something popped into my mind, something I did years ago that I felt really guilty about. It was really bothering me, and I was starting to feel guilty all over again. But then I stopped myself and reminded myself that God already forgave this! I asked for forgiveness years ago, and so I know I am forgiven! It was a good reminder for me... and my faith in the Lord! Gosh I am just so thrilled to see this was received happily! It's a relief to know I can also post about these types of things :) Thanks friends for your support on this subject. you are just a gem, friend and such a wonderful woman of God! i just love your heart. this is beautiful!